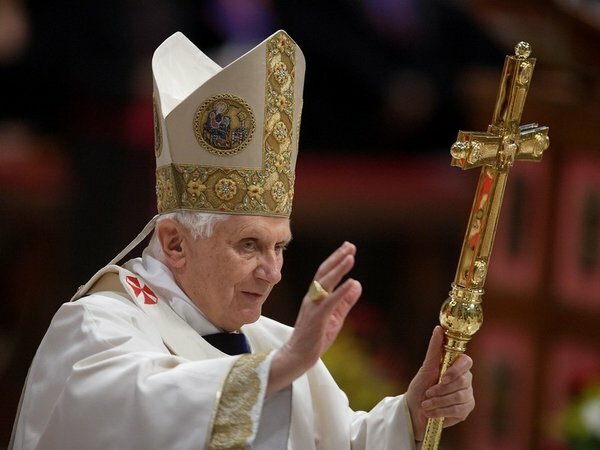 Pope Benedict XVI's second-in-command has urged Catholics in Ireland not to let clerical child abuse scandals shake their faith. Cardinal Tarcisio Bertone told the Irish bishops they must move from humiliation to humility if they wish to renew their church. Preaching at the Mass, Vatican Secretary of State Tarcisio Bertone said the scandal is humiliating but can be overcome by faith. Mr Bertone said: 'Challenges that come from within (the Catholic Church) are naturally harder and humiliating. 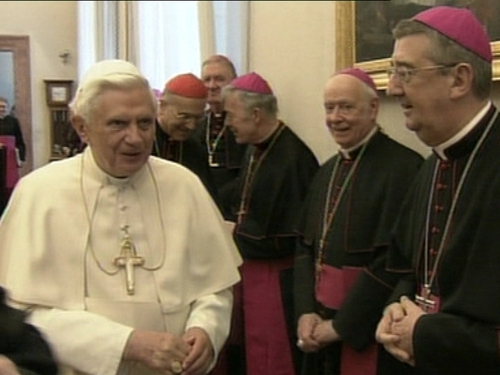 The comments came shortly before Irish bishops began a two-day meeting with Pope Benedict. The 24 senior clergymen are taking part in the unprecedented talks after being called before the Pope in the wake of the sexual abuse revelations. Meetings will be held in the Vatican throughout the day and tomorrow morning with the Pope and up to seven of his senior cardinals and aides due to attend. All-Ireland Primate Cardinal Seán Brady opened the summit with a presentation and each bishop is being given seven minutes to speak. The bishops and top Vatican officials prayed for survivors of sexual abuse at the tomb of St Peter's this morning. On the eve of the meeting, survivors of clerical abuse demanded leadership and accountability from the Pope and called for financial compensation for victims. Four bishops have already resigned over the Murphy Report, which unveiled a catalogue of child abuse and subsequent cover-ups over three decades by the Catholic hierarchy in Dublin. But the spokesman for the Irish Catholic Bishops' Conference, Bishop Joseph Duffy, said it was not their place to speak publicly about resignations. Christine Buckley of the Aislinn Centre has called for the Pope to travel to Ireland to apologise in person to the victims. John Kelly, of Survivors of Child Abuse, said the group wanted the Pope to restore honour to the country. 'The honour that was so severely damaged at home and abroad by the atrocities committed by the anti-Christ over the last 50 years,' he said. Abuse survivor Michael O'Brien said the Pope should apologise to the people of Ireland. 'We want the Pope to make a proper apology to Ireland, for what happened in Ireland,' he said. 'We don't want a bland apology, we want an apology to those of us in Ireland who were abused and to the people of Ireland who are 100% behind us on this. The Pope has also promised to send a pastoral letter over the abuse scandals, but it is not known when this will be published. Auxiliary Bishops of Dublin Eamonn Walsh and Raymond Field bowed to weeks of intense pressure and announced at Christmas Eve services that they were quitting their posts over the Murphy inquiry's findings. They were the latest senior clerics to stand down after Bishop of Kildare and Leighlin James Moriarty and Bishop of Limerick Donal Murray also resigned. Current Bishop of Galway Martin Drennan, also named in the Murphy Report, has repeatedly faced down calls for his resignation. Abuse survivors met Dublin Archbishop Diarmuid Martin on Saturday to insist he convey the distress of families and that the Pope accepts the resignations of Bishops Moriarty, Walsh and Field. They also called on the Pope to remove Bishop Drennan from office immediately and other bishops who failed to challenge the culture of cover-up. Bishop Murray will not attend the summit nor will Bishop of Cloyne John Magee who stood aside last March over his mishandling of abuse allegations in his diocese. Bishop Moriarty is attending as his resignation has not yet been accepted by the Vatican. Auxiliary Bishops Walsh and Bishop Field did not travel as only diocesan bishops were invited.